On Friday 31st March 2497 (Cosford) Squadron had their Annual Formal Inspection. This is a formal inspection held once per year in which our squadron can display to Wing Commander A. Griffin, Officer Commanding West Mercian Wing, the dedication and high standards that make up 2497 (Cosford) Squadron. 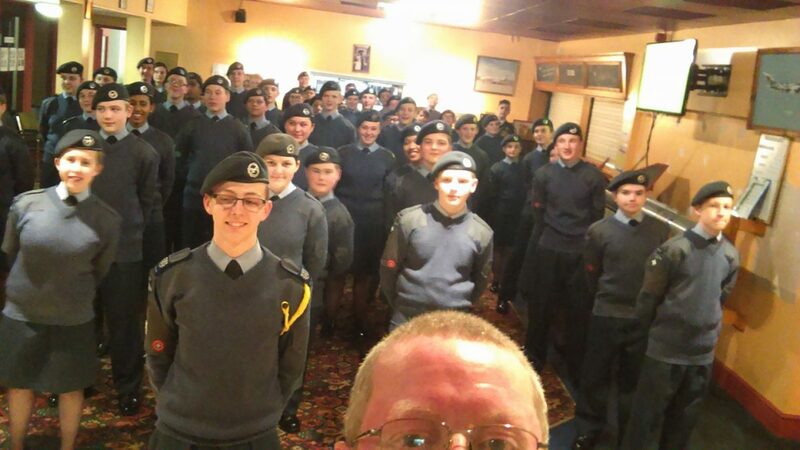 The night consisted of an inspection, a presentation given by myself, Cadet Sergeant T. Wassermann and Cadet Corporal A. Bryan that highlighted the squadron’s activities over the past year and finally a chance for all cadets to ask Wing Commander A. Griffin any questions they may have. During the inspection, the squadron formed up into two flights, the band, and the banner party. Wing Commander Griffin moved between flights, asking cadets and Cadet Non-Commissioned Officers questions about their cadet career. Following behind, Warrant Officer Clarke, Wing Warrant Officer, inspected the cadets. Later, the squadron performed a march past for Wing Commander Griffin and Warrant Officer Clarke, displaying our drill capabilities to the highest standard. Leading the parade, the band played songs such as RAF March Past, showing our musical capabilities on top of our drill. This year, our squadron did remarkably well and received a ‘Very Good’. This level is only one below ‘Outstanding’ – of which ‘Outstanding’ is enormously rare to any squadron. Due to our high performance, we have been placed as one of the best squadrons in the Wing.